On Saturday 20 June 2015, the People’s Assembly is holding a demonstration against austerity, starting at noon at the Bank of England and finishing at Parliament. Large numbers of marchers are expected – and joining them will be large numbers of Metropolitan Police officers working in Forward Intelligence Teams (FIT), as Evidence Gatherers and as Police Liaison Officers. Their role is to gather intelligence – on an almost industrial scale – on people attending to exercise their rights of freedom of expression and assembly. This is not a new practice – but an adverse Supreme Court ruling in March means that the police now have judicial approval for the mass surveillance of UK political activism. How does Netpol plan to respond? Netpol wants to see a major shift in attitudes so that protesters choosing to cover their faces to protect their privacy becomes normal and commonplace on every protest and demonstration, rather than a decision taken by only a few. We are therefore raising funds to produce hundreds of bandannas, which we plan to distribute at the start of the march on 20 June. 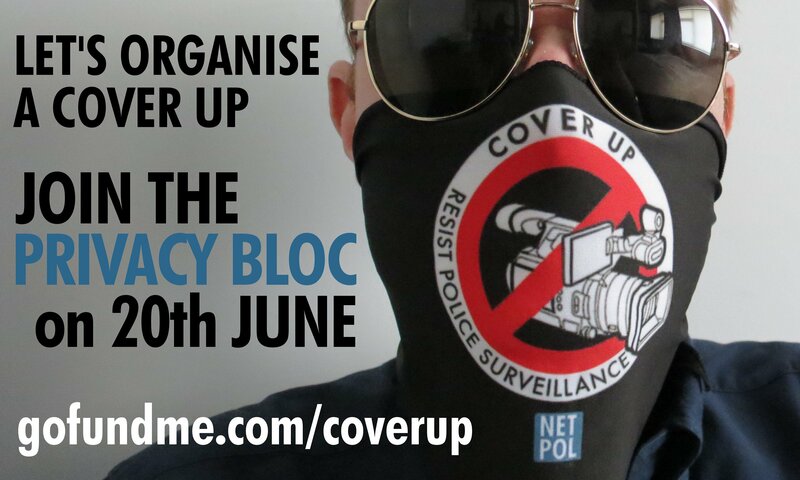 We also want to encourage protesters to cover their faces and join our ‘Privacy Bloc’ – a masked celebration of the importance of protest anonymity and our opposition to the growing police surveillance. To ensure that the Privacy Bloc is a success, Netpol needs to reach its funding target by Friday 12 June at the latest. You can make a donation (of at least £5) by clicking on the button below. 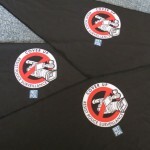 We will post you a face covering as soon as they are produced. Here is a draft email to copy and send out – if you have donated already, amend the wording to mention this too? A recent Supreme Court case has provided judicial approval for industrial-scale police surveillance on protests. We can either accept that taking part in a march or a rally means our presence is routinely noted and recorded, or we can start to resist in a more far more active way. At the People's Assembly demonstration on Saturday 20 June, an alliance of  campaigning groups, the Network for Police Monitoring (Netpol), plans to try something different. They want to distribute hundreds of bandannas at the start of the march and encourage protesters to cover their faces as part of a 'Privacy Bloc', which celebrates the importance of protest anonymity and opposes the growing surveillance state. 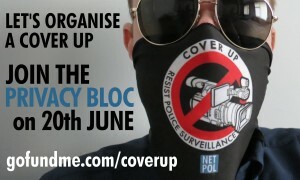 Even the Met police own legal advice recognises that covering your face is both effective and entirely legal: individuals are “under no obligation to facilitate the collection of… information and can usually, for example, shield or cover his or her face to avoid a photograph being taken…"
To make sure the Privacy Bloc happens, Netpol is asking for help to raise funds. A small donation of just £5 pays for two face coverings: one to post to the donor and one to give away on the streets. Netpol needs to reach its target by Friday 12 June at the latest. Invite people to sign up to our Privacy Bloc Facebook event.